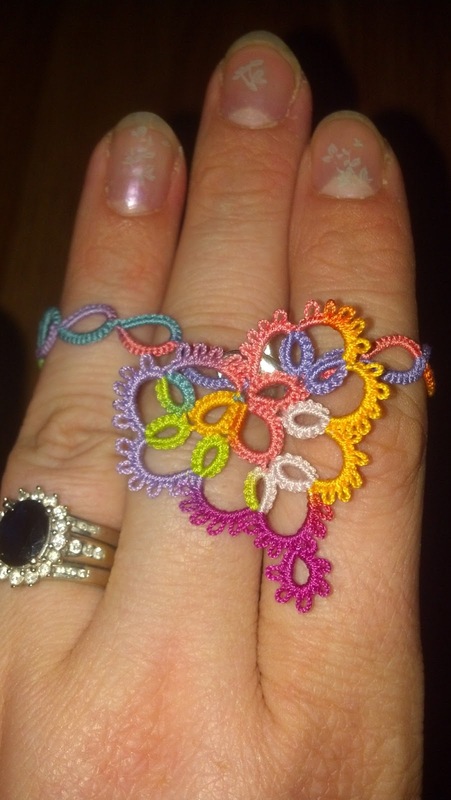 As I sit here, my brain is still processing everything that I took in during Angels Among Us – 17th Annual Shuttlebirds Tatting Workshop. The short version is that I had a ton of fun, learned a lot, met a bunch of fantastic people, and cannot wait until next year. 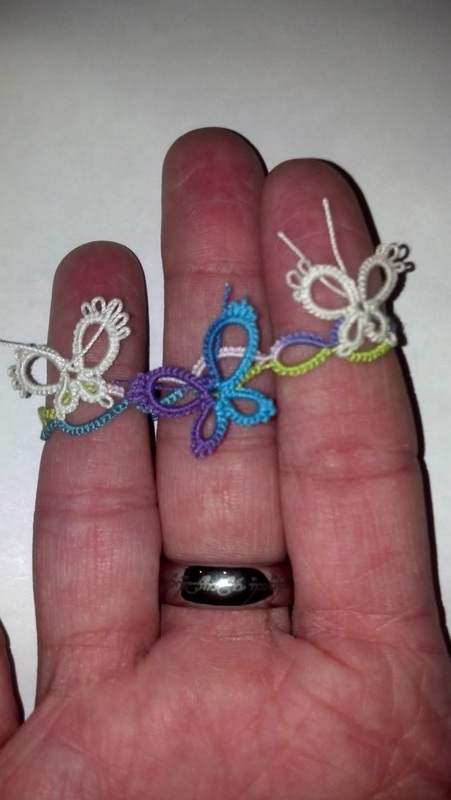 Every tatter should plan to attend the 18th Annual Shuttlebirds Tatting Workshop. So mark your calendars for April 25-26, 2014. 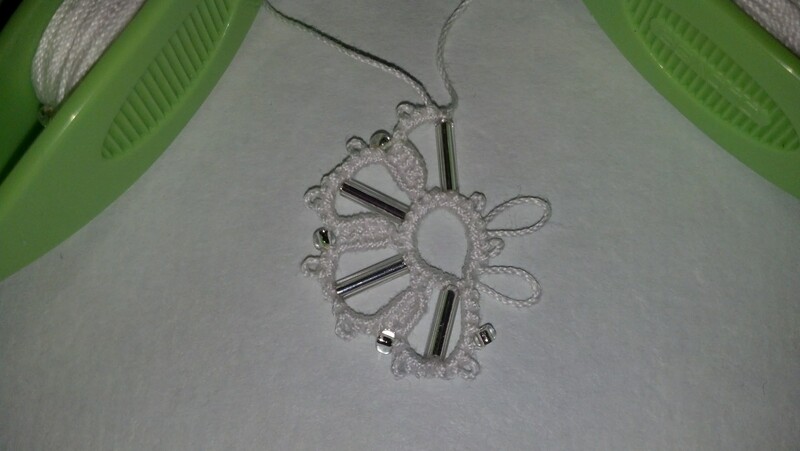 Having only learned of tatting in August of last year, this was my very first workshop. I arrived early to help with the set up. I helped make the fruit salad for lunch and then helped get a few tatted items up for display. Everyone brought in such beautiful work. I am in awe at the time and attention to detail that went into the shawl that Irene R. purchased at an IOLI convention. The patience that tatter must have had in order to complete such a large piece is amazing. There were so many wonderful items on display: adorable hats, beautiful butterflies, delicate snowflakes, colorful dragons, delightful doilies, a tatted mobile, a sneak peek for one of next years classes, and so much more. 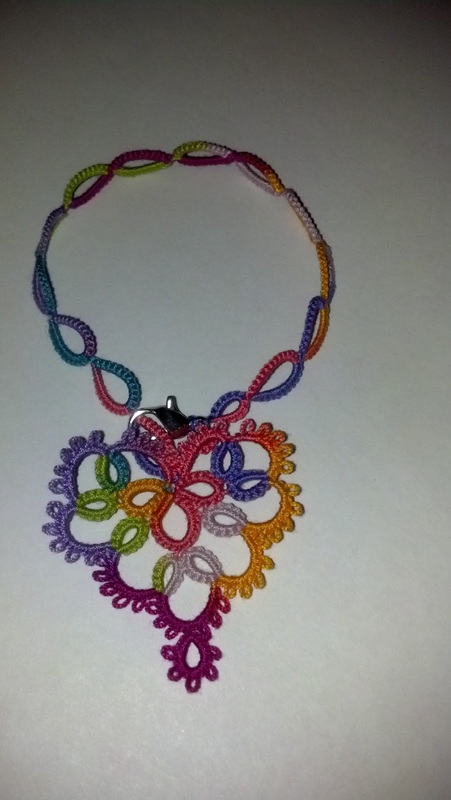 The tatting community is wonderfully talented. It was during this time that the vendors began to set up. I had never seen so many colors and sizes of thread available in one place before. Not to mention the variety of shuttle types and books galore. DS9Designs had a wide selection of thread, shuttles, and books to choose from. 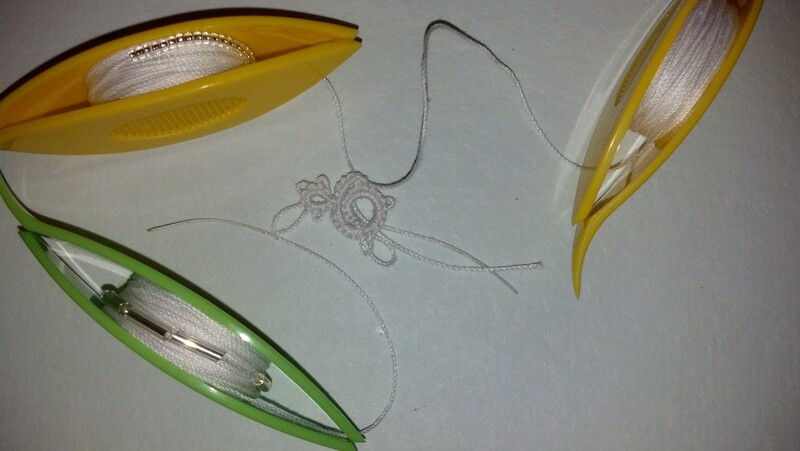 Snowgoose had several tatting kits in addition to their thread, shuttle, and book displays. Beyond Beads had several colorful display tables filled with marvelous bead choice and many needed findings. It was wonderful to see thread colors in person. 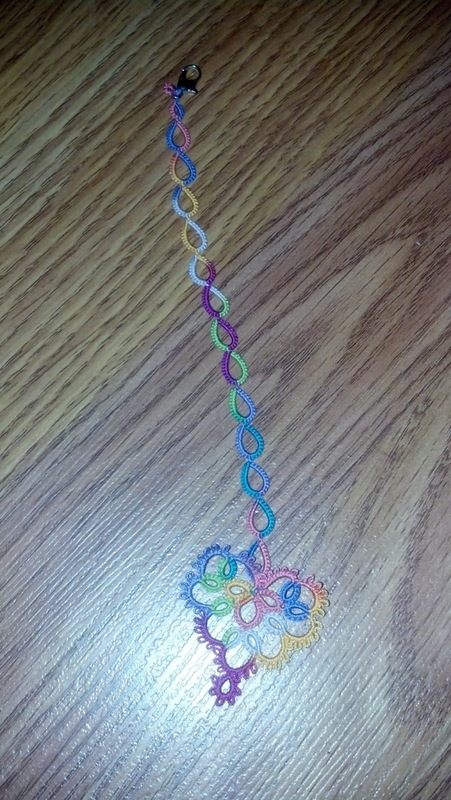 My tatting kit definitely expanded over the weekend. 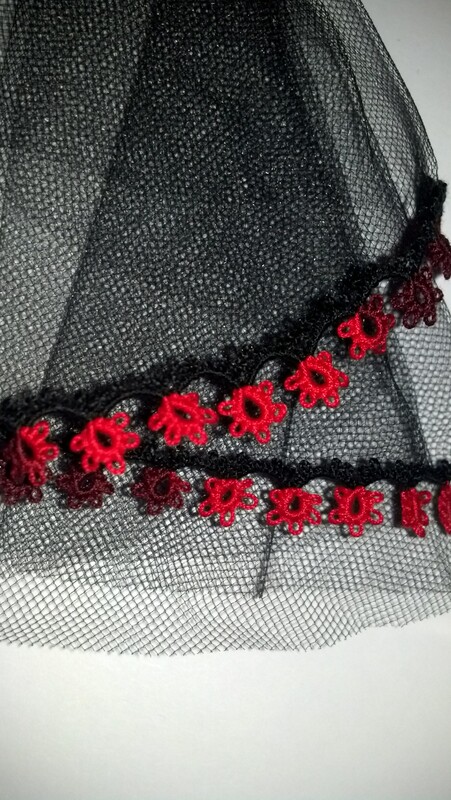 My progress on the mini veil pattern by Jessica Spaulding. Eventually the circle will have a complete tatted edging and look really neat when folded. Lunch was delicious and the tatting goodies at my seat were a nice surprise. 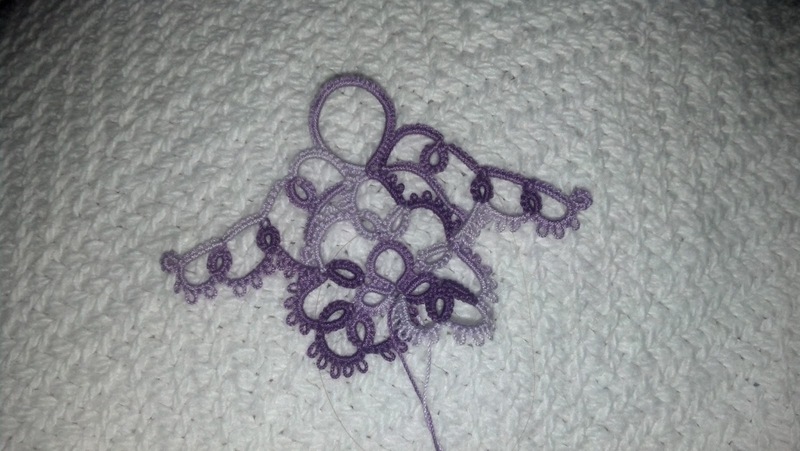 Announcements followed lunch and then it was off to my first class, Tatting on Tulle with Jessica Spaulding. 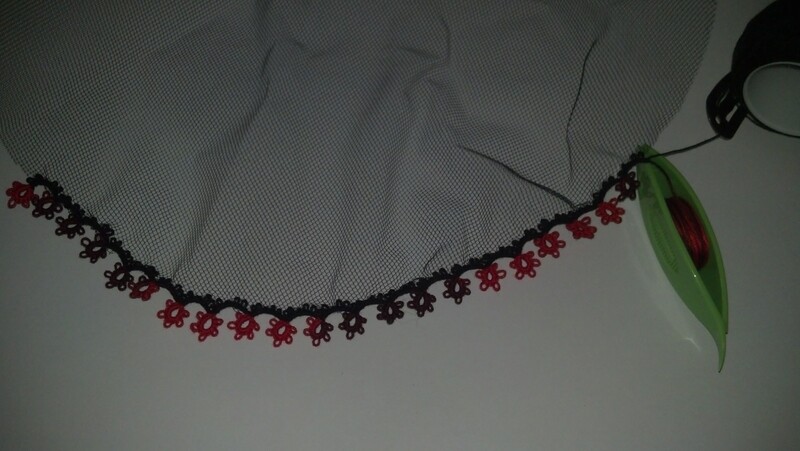 This was my first foray into edging. Jessica shared several samples with various edging patterns and we were able to get started on the simple edging she provided in the pattern. I’ve made it about 1/4 of the way around my tulle circle at this point. It was interesting to see the range of how far people were able to progress around the circle in the two hours allotted for the class. I think I only made it through eight repetitions by the end of the class. The trick to this project is making sure that you don’t catch the tulle as you complete the join. This is the progress I made on Dale Pomeroy’s snowflake pattern during class. There was a small break between classes and then I was off to learn how to make the 2011 Snowflake with Dale Pomeroy (aka The Mad Tatter). I learned several things in this class: a size 16 crochet hook is a must when working with bugle beads, threading beads is a slow process for me, there are a wide range of terms for the same concept, not all silver beads will stand the test of time, challenging patterns can be fun, anything can be used as a picot gauge – including plastic newspaper ties, and size 16 crochet hooks have a tendency to break. I really enjoy this snowflake pattern and over the next few weeks I hope to finish all my in-progress class projects. My progress undoing the Retro Tat-Off piece after ten minutes. The complete beginner Tat-Off pattern. I had only gotten a few stitches into the last ring when the ten minute timer went off. Next up was dinner and more cute goodies at our seats. 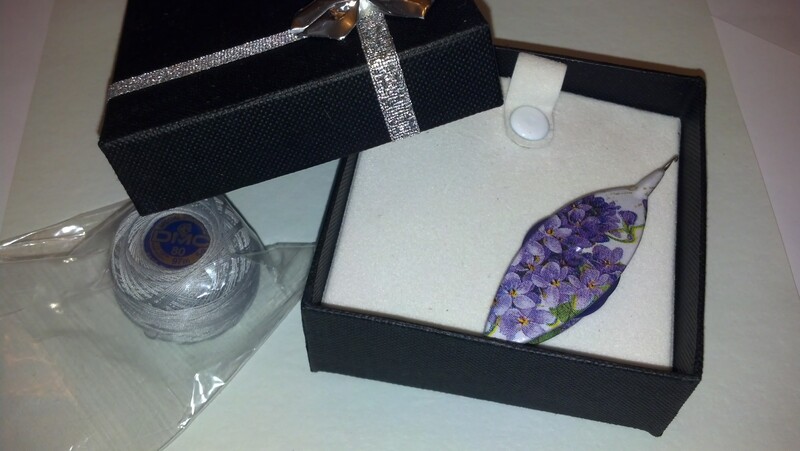 This was followed by door prizes – I got a cute gift box with a decorated bobbin shuttle and some size 80 grey DMC thread. Then it was on to the retro tat-off. 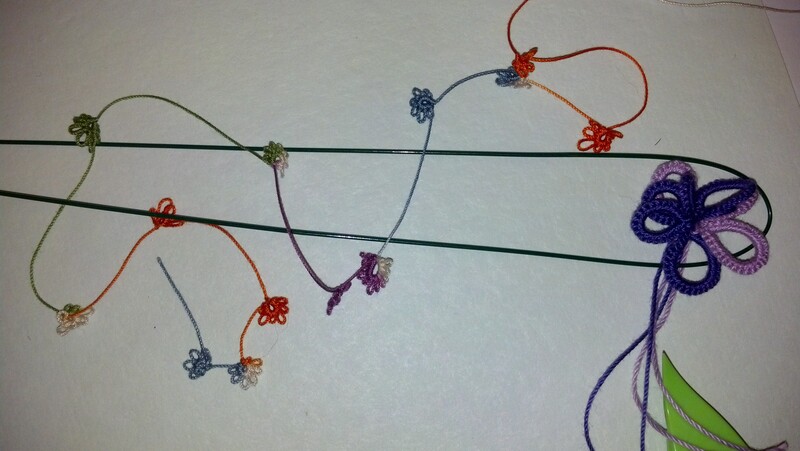 I think that was the most fun I’ve ever had undoing knots. I felt pretty proud that I was able to start undoing the first ring even though I was no where near as close to the winner, Jessica Spaulding (who beat out second place by a stitch). Then it was onto the tat-off. I managed to earn the fastest beginner title with a row of chains and rings. It was amusing to hear the commentary of the tatters watching the event. The tatters competing in the non-beginner tat-off had an angel pattern to complete. Three speedy tatters managed to get started on their second angel before the ten minute time limit ended. Wendy Griffin managed to get just a little bit farther on her second angel then the other two did. The tat-off and retro tat-off were a lot of fun! Thus ended day one of the workshop. This is the progress I made on Dale Pomeroy’s 2008 Snowflake pattern. 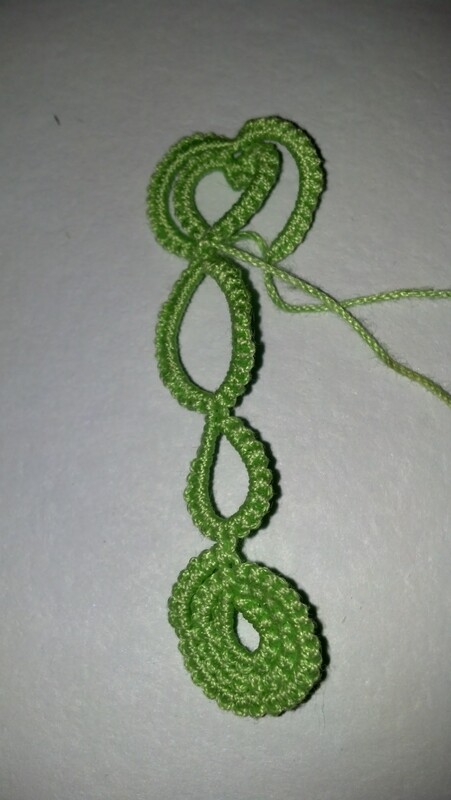 It doesn’t look like much, but I practiced two techniques new to me: shepherd’s hook loop and Catherine wheel join. I was able to help layout the goodies that people received at their spots for breakfast. We were also instructed to mingle – so I sat with a different group of tatters today. Following announcements, I headed off to my second class with Dale Pomeroy. This one was his 2008 Snowflake design. There were two of us in this class. I learned that Elmer’s glue crushed into the thread makes for a great beading needle when dealing with petite beads and the differences between thread types. I was also taught several techniques that were new to me: Catherine wheel join, shepherd’s hook loop, and a technique for hiding the ends. Dale’s explanation of the phrase, “It’s the ending that dictates the beginning.” makes it so I will never look at patterns in quite the same way again. We had a wonderful discussion about techniques that all three of us enjoyed and both students left confident in being able to complete the snowflake pattern. 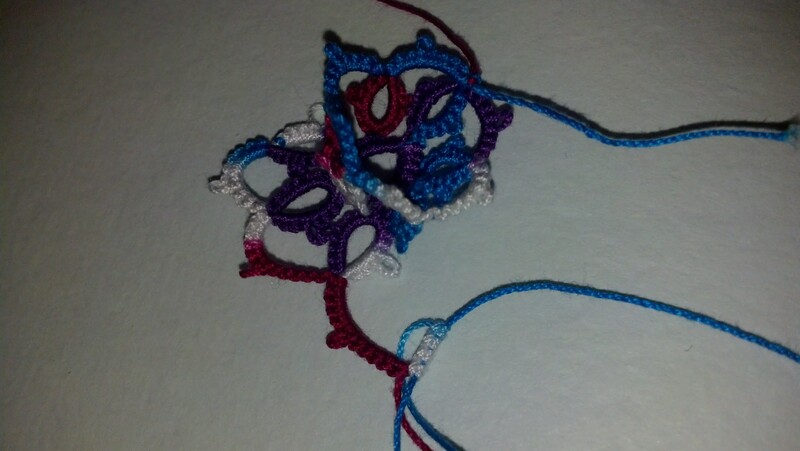 Progress I made on Sherry Pence’s 3D Flower Barrette pattern in class. A delicious lunch was followed by more door prizes. 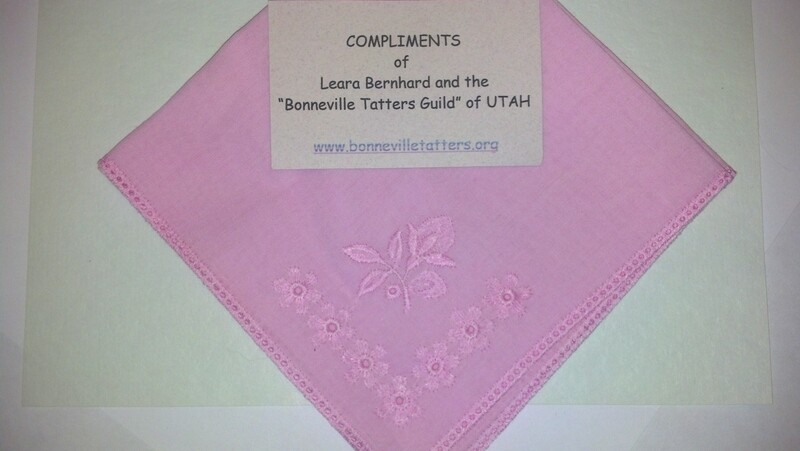 I received some delicious mints with a pretty pink handkerchief that I can tat an edging on. We then took a group picture complete with signs reading “Please come to Shuttlebirds Jane Eborall.” Then it was off to class. I took 3D Flower Barrette with Sherry Pence. It was a fun class and I should have been able to finish the project in class if I hadn’t been trying to apply all the techniques I learned in my previous class. I can see several of these barrettes in my near futures for my little sister and my niece (as well as myself). 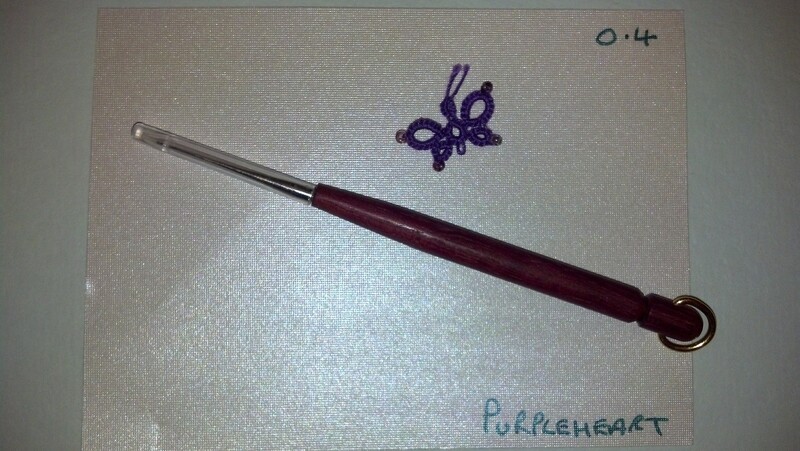 This class was followed with a break that included more doorprizes (I got a purpleheart wooden handle size 16 crochet hook with a cute tatted purple butterfly) and the theme contest winners. Neither of my angels placed, but I am proud of them and glad I entered. The bead was made by my co-blogger and fellow guild member, Davina. 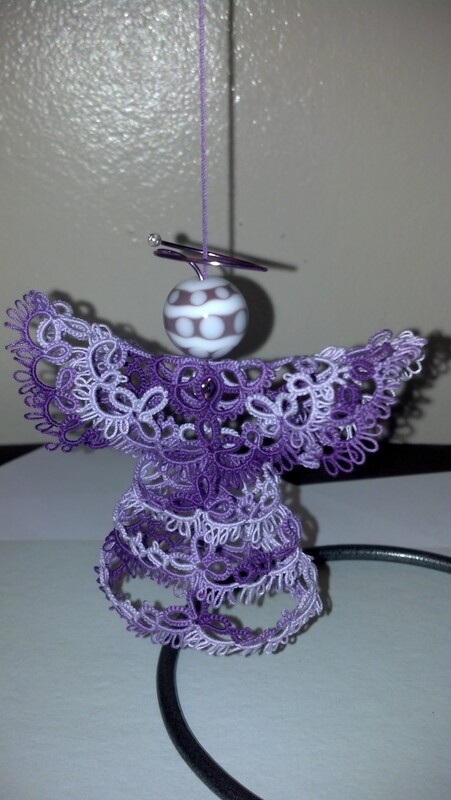 Sandy C. for Hairpin Lace Angel in the 2D published angel pattern category. Sherry Pence for Gwen’s angel in 2D original angel pattern category. Davina Achen for Angels Surround in 2D adaptation of published angel pattern category. Aloma B. for Trefoil Angel in 3D original angel pattern category. Sandy C. for Three D Angel 1997 in 3D published angel pattern category. My fantasy flower elements in progress. Then it was off to my last class, Fantasy Flowers with Pat Stevens. I am very grateful that I had such a free flowing, non-pattern following class in this slot. I learned all sorts of ways that I can use practice pieces to make pretty flowers. I plan on having a bouquet of flowers ready to display next year. Dinner was delicious and I was able to sit and chat with several tatters about the highlights of the weekend. I hope to see everyone next year! 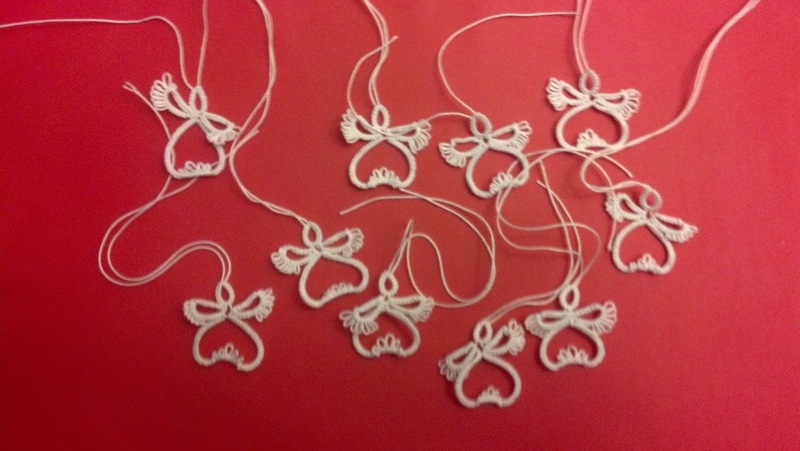 As some of you know, last weekend was the Shuttlebird’s annual tatting workshop. There will be several post about all I learned there but one of the best tips I learned came from Aloma B, of the Bonneville Tatters. 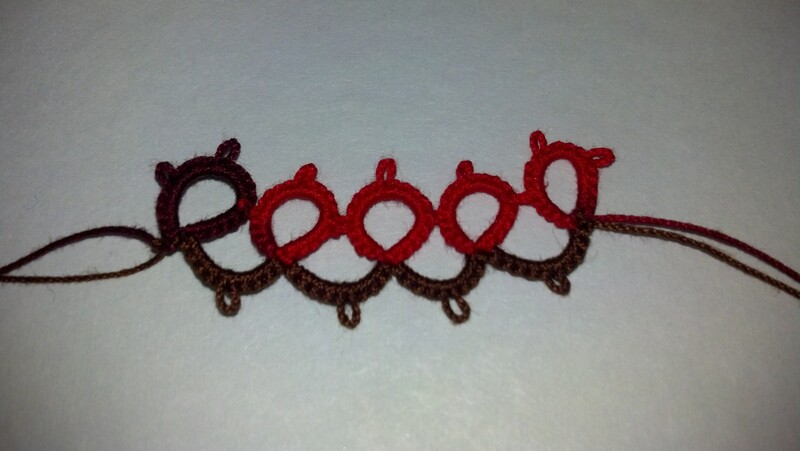 I am very rarely without a tatting project with me. I have tatted just about everywhere. Usually, I just grab a small project and shove it in a pocket on my way out the door. Occasionally, i find myself spending valuable tatting time trying to pull the hook of my Aerlit shuttle back thru the pocket lining. Even more often, I find myself poking myself with the hook as I move around. 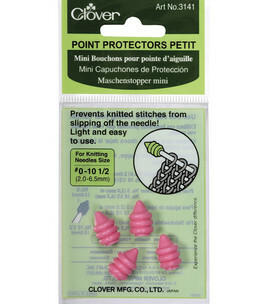 Aloma solved this problem by covering the hook with a set of petit point protectors usually used for covering the ends of knitting needles. I could not get myself to the store fast enough. $5 well spent to save my shuttle, my pocket and my upper thighs. 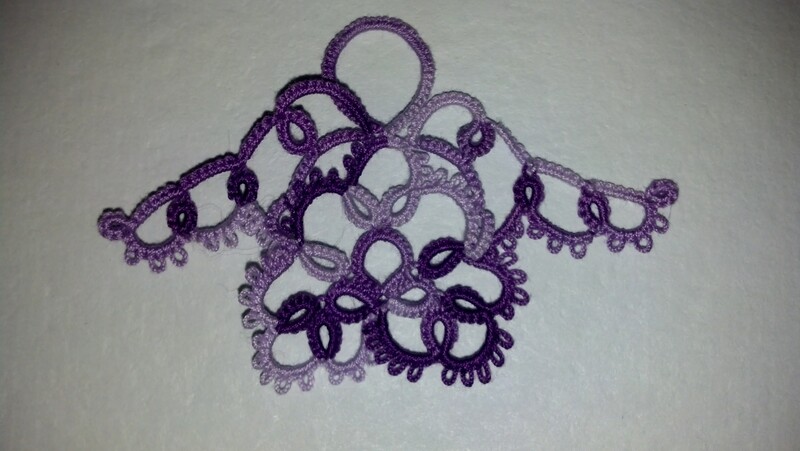 I’ve been keeping busy in my tatting. The week before Easter my cousins were up for their Spring Break. I had a blast with the three boys – lightsaber fights in the backyard and Nerf gun wars in the basement. My cousin Emma (the youngest and only girl in the lot the came to visit) loved the look of my tatted things, and probably would have taken home my entire completed stash if I had let her. Instead, I tatted up a bracelet for her. It’s the accidental heart on a split ring chain. She loved it. Little girl wrists are tiny! I really like how the two variegated colors worked with each other! Then it was on to birthday time. Last weekend I had two birthdays to attend. 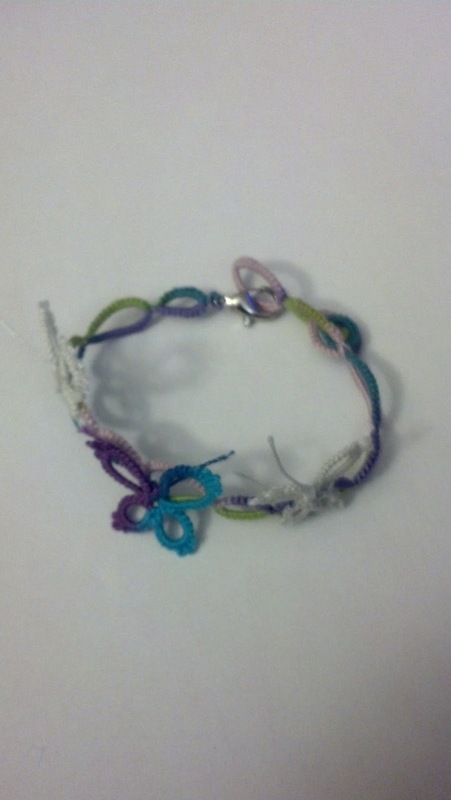 A sweet wonderful nine year old (for whom the following bracelet is made). And my Evil Twin (it’s a camp thing) for whom I made a heart necklace. Again, little girls have tiny wrists. Then it is onto angels and the Shuttlebirds Workshop which is coming up, April 19-20. The theme for this year’s workshop is Angels Among Us. This will be my first workshop and I am super excited! My contribution to a guild project. An angel for the themed contest. This little cutie is my own design. I’d love to hear what you think of my angel. 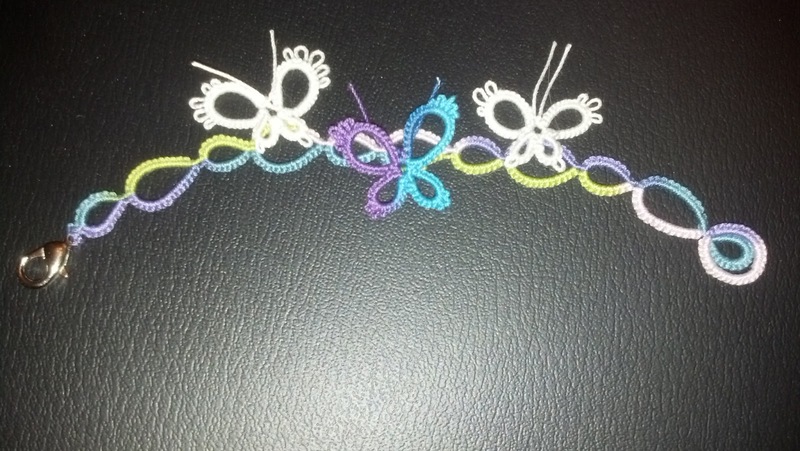 Happy tatting!